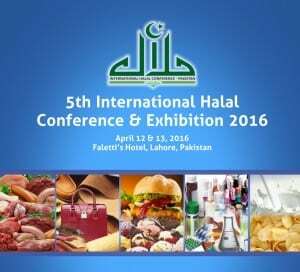 LAHORE – Punjab Halal Development Agency (PHDA) is holding 5th International Halal Conference and Exhibition, 2016 here from April 12 to 13. PHDA Chairman Justice (r) Khalilur Rahman Khan said that prime objective of the event was to showcase livestock and allied industries before the international community to increase the halal trade of Pakistan. Talking to The Nation, Justice (r) Khalilur Rahman Khan said the theme of the event, this year, would be ‘Halal culture and trade-strategic game changers for world peace and economic prosperity. “We would like to call upon the stakeholders of the halal food industry to seriously make efforts for seizing opportunities and tapping new potentials, which could contribute to the economic and social development,” Khan said, adding, “This year, the conference will deliberate on the item halal as a differentiating factor, cross-border trade, nurturing future talent and entrepreneurship development with the aim to target the youth and empower women. Giving details, he said there would be technical sessions, panel discussions, exposure tour to halal value chain, cooking competitions and many more both at the conference and the exhibition. He added that PHDA had been organising international halal conferences and expos in Pakistan for the last four years in order to give impetus to Pakistan’s halal food industry. He further informed that more than 20 MoUs were signed with the national and international traders during the last exhibition, held in 2015, with a commitment to work together to give a push to the sector. “In the upcoming expo, several more agreements will be inked, particularly with the Chinese Quarantine Department, to bring new investments to the halal meat industry and open doors for new businesses so that a broad-based economic growth could be ensured,” Khan elaborated. The PHDA chairman hoped that the presence of Chinese Quarantine Department’s delegation at the event would lead to the start of Halal meat exports to the Chinese markets from Pakistan. “Both the conference and exhibition would provide a platform to develop business linkages, and will give the participants an opportunity to discuss the investment potential of Pakistan’s halal food industry,” he added. He said the agency had facilitated the visits of more than 50 international buyers and exhibitors to Pakistan so that they cold observe the livestock and Halal value chain by themselves. “The PHDA has also planned field visits for the foreigners to livestock farms and allied industries to highlight strengths of the Halal food industry,” he added. The PHDA has asked the stakeholders to participate in the conference to learn about meat, poultry, dairy and its by-products, cosmetics, pharmaceuticals, beverages, Islamic Financing and other related concepts. He said that PHDA along with other government agencies was working to improve the business environment by promoting policy and regulatory reforms through private sector-led advocacy. These reforms, if implemented, are expected to spur investment in dairy, livestock and horticulture sub-sectors, leading to fast-paced employment generation. This year, the exhibition will bring together heads of government and prominent leaders, including Federal Minister Sikandar Hayat Bosan and Federal Minister Ahsan Iqbal to share their views, provide latest updates on halal food industry, deliberate on pertinent issues. More importantly, the conference is aimed at further strengthening strategic collaborations in halal food industry, which is expected to attract more participants, including foreign delegates from over 50 countries worldwide. Khan said that it is a conference held annually converging Government representatives, business leaders, halal industry players, entrepreneurs, scholars and stakeholders from all over the world to Pakistan, with the common aspiration to further accelerate global halal industry growth. This conference has also in the past, provided the ideal platform for intellectual discourse on issues pivotal to halal industry development and also inspired export enhancement through novel findings and innovation.